I always want to paint on canvas, but I’m not that skilled with a brush, sure I can paint a word or two like I did on these instagram canvases, but I just found a great way to utilize a canvas without having to pick up a paint brush! I wanted a large piece of Easter artwork but didn’t want to shill out the $. When I found an Easter t-shirt for my daughter at the thrift shop I knew I wanted to mimic the print. Project challenge- I think so! Cardstock in 6 different colors, one sheet of glitter paper (for the bunnies) I used DCWV silky smooth cardstock stack in brights. 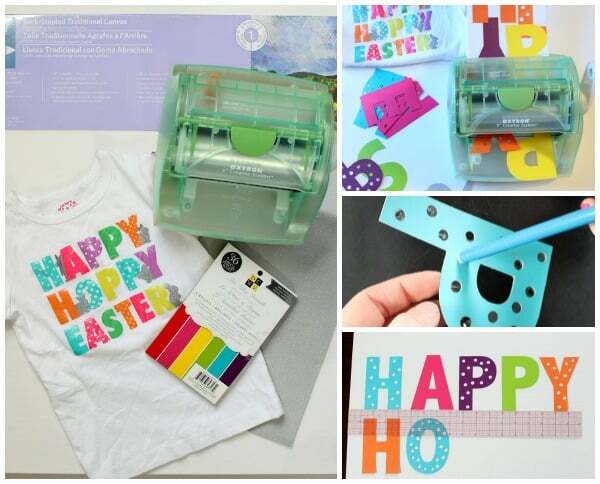 An electronic cutter, large letter stencils, or you could print letters and bunnies and cut them out by hand. Cut out the letters, alternating colors, some with holes (you can do this with a hole punch, or with your electronic cutter). Also cut bunnies from glittered cardstock. Run each letter through the Xyron Creative station. Rub the top of the letters to ensure they are well stuck, peel off the top plastic layer. If there is adhesive inside the dots, you can poke a pencil in the holes to remove it. Using a ruler, or straight edge line the letters up (but don’t press down until you’re sure of the spacing, and your bunnies are in place). Add the bunnies, cutting off their bums so they appear to be poking out from behind the letters. Press letters in place. I added a strip of ribbon to the edge of the canvas for a bit of definition (I used May Arts orange 3/4″ chevron). Don’t you just love how cheery and bright it is! I wish I could better capture how glittery the bunnies are. I can’t lie I tried putting a coat of glitter decoupage over top. It. Was. An. Epic. Fail! It made the paper curl and made a complete mess, so I wiped it off and trashed that idea. The Xyron certainly gives the necessary hold, I just wanted the glittery look- so if I were to do it over I would start by painting the canvas with a bit of glitter and letting it dry before applying the letters. 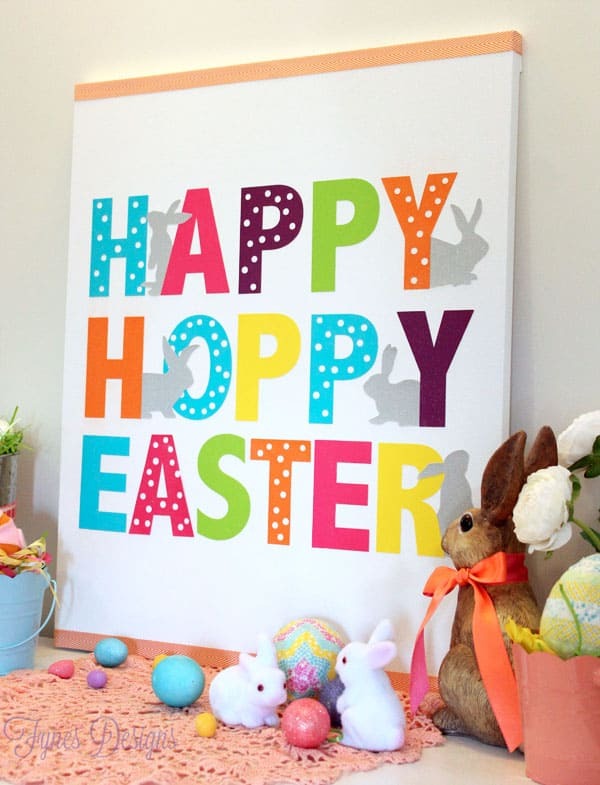 For those of you that don’t have the crafty gene you can enjoy the Happy Hoppy Easter Canvas as a Free printable! 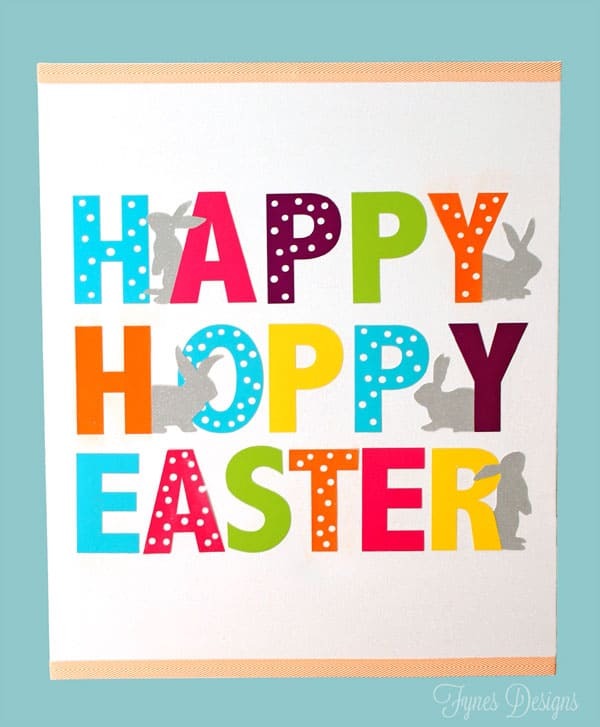 Thanks for joining me for this cute Happy Hoppy Easter Canvas! Looking for more Easter Inspiration? Oh so PRETTY!! Ok, so I had NO IDEA that Xyron had a cutting machine! How awesome! 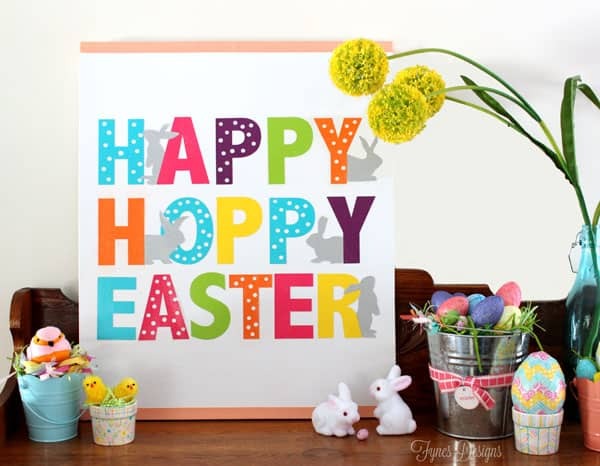 I love the Hope Easter wreath! That is so pretty! Beautiful blog by the way. What a great design! I love how quick and easy it is to make! Very professional looking! You did great job. Thanks. I do enjoy seeing all the great things you produce. You could also put bunnies in your Xyron “face down” and apply glue then glitter(I usually dip in a larger container burnishing well), then run through again to get adhesive on the bunnies “backside” giving you ability to adhere to canvas. Thanks June, Thats are great idea! I’ll have to give it a go! As always I find your creations so inspiring. Love them! It is so beautiful! You are really talented! I have to try this! This is so crazy cute Virginia! Love all of the colors! !